“seen and those things hidden”. Margie creates a body of work that is multi-layered and eclectic. Her intention is to create layers of interesting textures and lead the mind’s eye on an aesthetic journey. Jacob works in both clay and canvas. He enjoys the challenge of hand-building architectural forms with lots of detail. His attention to detail does not stop at the exterior. Look inside. His buildings have the feeling of a ship inside a bottle – large pieces that defy the scale of the structure that they are placed within. The building takes on an interesting narrative. What do you see in Margie’s paintings and find inside Jacob’s buildings? As always, we will be hosting live music. Bill Ellingboe is a Grand Haven-based musician and songwriter with a strong affinity for music that at times has been labeled everything from Americana, to Roots, to Folk. He is currently working on a new collection of songs to be released in the summer of 2015. C2C Gallery is an art gallery with a working ceramic studio located in downtown Grand Haven. 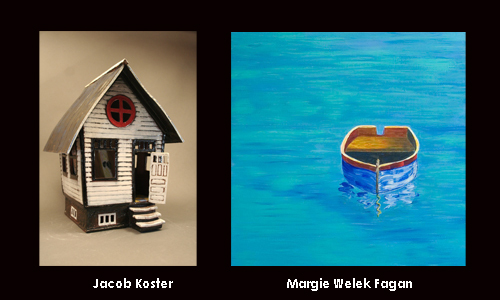 Each month, we feature a Midwest artist reception on the First Friday of each month. On these First Fridays, in addition to the featured artist, we host local live music. We offer more than 35 acclaimed Michigan artisans in ceramics, photography, paintings, hand blown and fused glass, hand fabricated silver jewelry, hand painted scarves, wood sculpture, and textiles. For more information see http://www.c2cgallery or call 616-935-7337.